Digital domains are maturing fast in Metso's business environment. Metso has set up a Digital Program to accelerate the company to a new level in digital capabilities, required to succeed in the future of minerals processing and flow control. Metso's ambition is to become one of the digital leaders in the industries it serves. This means for example turning customer interaction more data-driven, and proactively addressing issues and opportunities based on insights drawn from data. "Digitalization is an integral part of our business development, supporting our growth," says Matti Kähkönen, CEO, Metso Corporation. "We focus on very practical and concrete ways to go forward. Digitalization is a tool to make things happen. New technologies are here and new business models can help us grow," he continues. The Metso Digital Program has three priority initiatives. In mining, we will help Metso's customers to understand and improve their comminution assets and processes with the effective use of Internet-of-Things (IoT) and analytics. In aggregates business, we will revamp our online capabilities and provide an engaging digital customer journey for the entire equipment lifecycle. In flow control, we will build new digital tools to better respond and deliver on the changing customer requirements in our project business. In addition, selected other digital innovation areas such as 3D printing, combined with agile deployment, are in the digitalization focus. The Digital Program is part of Metso's overall business strategy and is managed by Metso's Digital Office working in close cooperation with Metso's businesses and units. The Digital Program is executed following agile methodologies, portfolio management and continuous improvement. "As a company, we are in a good starting position what comes to digitalization," says Jani Puroranta, Chief Digital Officer, Metso Corporation. "For example, with IoT, we have already developed a first generation of solutions, including valve diagnostics, remote monitoring of Lokotracks, and a telematics system that collects high-speed data from large cone crushers," he explains. "We will create digital solutions to reshape our industries, and our experts will be working with our customers and distributors to fully embrace the opportunities of digitalization." 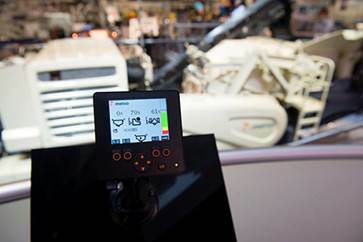 More information about Metso and digitalization is available on our website at www.metso.com/digital. Jani Puroranta, Chief Digital Officer, Digital Office, Metso Corporation, Tel. +358 20 484 100 Email: jani.puroranta@metso.com. Metso ICr(TM) wireless automation and control system for Lokotrack® helps to improve efficiency and safety. Read more on our website.